Here’s a round-up of excellent, must-try Filipino restaurants if in search for either traditional or modern take on signature favourites. Serving traditional Filipino food, mostly of Capampangan origin, Abe is an ideal setting for friends and families who wish to dine comfortably and have a good time. Warm your stomach with Abe’s signature sinigang sa ube. One bowl is enough for a taste of the sweet pull of ube (purple yam) mixed into soup, tender cubes of pork, and crisp vegetable greens. Go for the balo-balo, a delicacy of salted rice and shrimp paste that can be rolled into mustasa (mustard) eaves. Add some exotic arobung camaru (fried crickets) into the wrap for an extra crunch. Lastly, order steamed bamboo rice with kilayen babi—spiced pork liver sautéed in vinegar and drenched in coconut cream a comforting dish that pairs well with the rest of the meal. The chef Fernando Aracama’s eponymous restaurant does not disappoint diners looking for authentic Negrense dishes in the middle of the city’s nightlife destination. Influenced and inspired by the flavours of his cherished home island, the chef Aracama proudly showcases a well-thought meny highlighting delicious regional Filipino cuisine with sincerity, respect for tradition, fresh new ideas, and his inimitable sense of humor. Don’t miss the malunggay mozzarella dip that comes with a generous helping of bread. Have the crispy binagoongan na baboy (pork stewed in shrimp paste). It’s good to share with another main dish like the sinugba na baka (grilled beef). End with the crispy suman, red rice cakes with ginger ice cream which its subtle flavours perfectly complement in taste and texture. What used to be a small-time mobile eatery has become a successful casual dining restaurant in Roxas Boulevard that has been frequented by Manila’s elite and significant personalities. Among Asiang’s specialities are the restaurant’s signature chicken barbeque, pancit luglog, lumpiang ubod, crispy pata, and more, of which the flavours have never changed a bit. Entertaining guests for 20 years now, including distinguished foreign dignitaries and state officials, Barbara’s by Barbara Gordon-Delos Reyes is a restaurant fashioned out of a restructured 19th-century bahay na bato. Besides its excellent menu and colonial-styled interiors, the guests are entertained by cultural performances like rondalla and traditional Filipino dances. Barbara’s offers a conglomeration of cultures as it serves Filipino dishes with Spanish, Indian, and Chinese influences. The Seafood Amelie, pastel de laguna, roast beef, amd turon are just some of the dishes that made Barbara’s culinary landmark in Intramuros. If in search for a restaurant that serves authentic Ilocano cuisine in Manila, Balai Ilocos in Parañaque City is the place. The restaurant reminds you of Calle Crisologo’s old houses and is adorned by photos of the restaurants’ family owners. Indeed, Balai Ilocos serves authentic Ilocano bagnet, that is deep-fried pork belly with crisp and crunchy skin. Other must-try dishes of the restaurant include pinakbet and Vigan longganisa. The chef Tony Boy Escalante of Antonio’s has transitioned from global to local, proudly serving native Filipino cuisine at his relatively new venture, Balay Dako, which means “Big House” in the Negrense dialect. 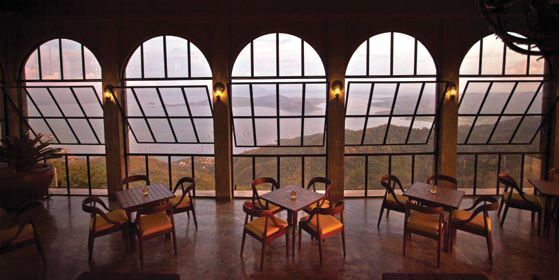 Completing the dining experience is the sweeping view of the tiny Taal volcano and its serene lake. Order its bestseller, sizzling bulalo na baka, which is a deconstructed version of the classic bulalo and served on a hot plate and poured with delicious mushroom sauce. Have a plateful of the big boneless and fried to crunchy perfection, bangus a la pobre, and the two-in-one meal pinakbet na kanin with lechon kawali, which is fried rice mixed with stewed vegetables and topped with deep-fried pork belly. Drive all the way to Pampanga for an authentic Capampangan gastronomic experience at the chef Claude Tayag’s garden restaurant, Bale Dutung, which translates to “house of wood”. A glass of calamansi fruit juice sweetened by muscovado (unprocessed sugar) ice cubes welcomes diners who are invited to try the chef Tayag’s specialities like the fried lumpiang ubod, the sinigang sa bayabas called as “bayabaisse”, seafood kare-kare, and the popular dessert Paradiso (yam, coconut, egg yolk in carabao milk). A perennial Cebuano favourite, this restaurant serves a wide variety of authentic home-style Filipino dishes. This is the definite must-visit place in Cebu if you are looking to introduce Filipino cuisine to foreign guests. Besides the ambience and delightful presentation of its dishes, Café Laguna’s menu never disappoints. Among their notable dishes is the sinigang sa bayabas; made sour with guava which is a less common version of the traditional soup. Try also other dishes like kare-kare (oxtail stewed in peanut sauce), fried kangkong leaves, lechon kawali (fried pork belly), lumpiang ubod and Bert’s Kulaok (grilled eggplant with coconut milk). Café Laguna’s halo-halo and puto bumbong served with lemongrass tea are a perfect decadent end to your meal. Take a step back in time in this charming ancestral home-turned-restaurant and enjoy an array of scrumptious heritage dishes that reflect old Manila’s grandeur and rich Spanish culinary influence. Dine at any of the tables situated near the window for a glimpse of the Malacañan Palace and the restaurant’s lush garden setting adorned with contemporary sculptures. Nothing beats a classic Paella Valenciana that brings out a great blend of chicken, pork, and seafood flavours. Satisfy your cravings with the crunch pork stew binagoongan and the savoury fideos with slices of the smoky Spanish chorizo. Cap the meal off with any of the Casa Roces’ coffees or chocolate drink, Tsokolate Eh, and the luscious Malacañan frozen lemon custard soufflé. Tucked away in the heart of San Juan City, the chef Laudico Guevarra’s Filipino buffet restaurant offers over 50 sumptuous dishes to choose from. The restaurant has a nostalgic vibe in it with its colonial-styled interiors and architecture and relaxing atmosphere. Don’t forget to try the restaurant's classic Filipino heritage dishes like callos, kare-kare, pinakbet, dinuguan, and more. The buffet also serves popular Filipino delicacies in its dessert station like kalabasa pastillas, maja blanca, suman panna cotta, and more. Adorned with authentic Philippine hardwood furniture, colonial period ceiling fans, and chandeliers, Ilustrado restaurant echoes Intramuros’ rich history and culinary heritage. Founded by Boni and Rose Pimentel, the restaurant provides quality service and dishes that make you feel like a part of an Ilustrado family, a term used to refer to the elites during the Spanish regime characterised by being able to study abroad. The heritage restaurant takes pride in its Paella Ilustrado—the annatto oil-flavoured version of the paella Valenciana, adobong bagnet with prawns and oyster, and Sampaguita ice cream, with the national flower as its primary ingredient. Besides its convenient location within the central business district and adjacent to Greenbelt, there is also the beautifully designed space to consider. Kabila is a fixture for locals and expats alike, with its beautifully presented fusion food and live music nights. To begin a meal, you must try the Southern-style sinuglaw from the Kabila menu—a refreshing starter of vinegary tanigue ceviche in coconut accompanied by succulent charred pork liempo. This could be ordered in tandem with the incredibly tasty Szechuan-style crispy lamb ribs or the crab and polonchay fortune dumplings. The pork bagnet and slow grilled gindara are easily crowd pleasers. For dessert, there is the never ending parade of pastries such as ube tres leches and jackfruit sansrival—but what stands out is the mysterious Impossible Cake (a layered cake of moist chocolate sponge and leche flan, served with caramelised nuts). To end the evening, spend some time perusing the impressively large drinks list for a specially crafted cocktail or a bottle of your favourite wine. When you are looking for unadulterated Hispanic-Filipino fare, Lorenzo’s Way will give you more than what you’re craving for. Let your inhibitions go and savour heirloom recipes from appetisers to dessert. Begin with sabaw ng halaan at buko, a popular coconut-based soup with clams, chilli leaves, and ginger hailing from the eastern part of the Philippines. A must-try is the Paella Valenciana that offers a feast for the senses. The Spanish garlic chicken is also a sumptuous choice as it is slow-cooked and braised in garlic. Another all-time favourite is the KKK (Kare-Kare-Klub), which is ox-tail, beef, and assorted vegetables simmered in peanut stew; which becomes even more delectable when paired with steaming white rice. The chef J. Gamboa’s menu draws inspiration from Milky Way’s vibrant 60-year history. With its roots as a dairy bar and an ice cream parlor, the café has grown to include home-style Filipino food. One thing rings true for every diner who’s been to Milky Way Café: the famed halo-halo has been a favourite since the ‘60s, so remember to make room for dessert when you dine here. Start off with the lumpiang ubod, which is fresh vegetables wrapped in crepe-like wrappers and drizzled with garlic sauce. The baby crispy pata is mouthwateringly tender and packed with delight at every crunch. If soup is more to your liking, order the corned beef nilaga, which is definitely a favourite comfort food among frequent diners. Owned by Elvira Go, this restaurant is found at the ground floor of the Catholic Bishops’ Conference in the Philippines (CBCP) Building. It is frequented by bishops and cardinals, hence the name which refers to the cardinal’s headress, as well as foreign dignitaries and royalties just like other restaurants in Intramuros. Some of its must-try dishes include the favourite dishes of religious officials like Luis Antonio Cardinal Tagle’s silvanas and Bishop Joel Baylon’s tilapia strips with soy sauce. Try also Monsignor Gary Formoso’s pork medallion with mashed potatoes which is cooked to perfection. For a taste of heirloom dishes as prepared by the Filipino gentry of yesteryear, this brightly modern restaurant is the place to go. Owned by Enzo and Sandie Squillantini, the restaurant was named after the late Gen. Carlos Romulo who was a Filipino patriot and a lover of good food. Now, it has opened a branch in London, United Kingdom introducing the heritage dishes the Filipinos have loved through the years. Tito Greg’s kare-kare is a choice best suited for sharing, served with copious amounts of rice for a filling meal. Meanwhile, the boneless crispy pata binagoongan is both crispy and tender, with the not too overwhelming flavours of bagoong adding to the texture. For desserts, the delightfully redone deep fried suman sa latik is a good choice. XO46 is a gem of a Filipino restaurant that is perfectly confident about its mouthwatering dishes. Interiors used traditional fixtures in a sleek and modern way. One thing that this restaurant is notable with is its wait staff addressing guests as señorito and señorita that takes one back to an opulent period of the past. Start with the empanadang Bilbao à la Vigan, which is composed of chorizo, kesong puti, and red eggs stuffed in a puff pastry. It skillfully incorporates the richness of the chorizo with the more sedate kesong puti. For entrées, the bangus salpicao will remind your palate of the freshness and flavoursome simplicity of Philippine cuisine. Another terrific seafood dish is the Pateros Express in a decadent duck egg and olive oil sauce. For vegetarian enthusiasts, try the tasty Ginataang Sigarilyas, that utilises a creamy coconut sauce with crispy winged beans. Desserts call for something innovative and traditional. The halo-halo slush has the consistency of a milk shake with all the typical ingredients of the well-loved cooler. Apu reinvents authentic Capampangan cuisine for the cosmopolitan market, creating a fine dining experience of beautifully-plated Filipino dishes that are full of flavour and character. Start off lightly with tapas. The gambas aoli (garlic prawns) will kick-start your palate for the feast to come. The seafood kare-kare is an alternative beef version that’s just as filling, with a thick, nutty sauce that goes delectably well with the bagoong (shrimp paste). If you want to indulge more, go for the sizzling sisig (chopped pork mask) or lechon kawali (crispy fried pork belly) which are both crowd-favourites. The brazo de mercedes stands out with its pillow-like outer layer and its creamy, semi-sweet custard core. Founded by friends Abba Napa, Eliza Antonino, and Jon Syjuco, Manam Comfort Filipino is a homegrown concept by The Moment Group. The menu features dishes that the owners have grown to love and crave from their childhood and travels. The culinary team led by the chef Ernz Owera developed a spread divided into two: classics and twists. From the “classics”, there is the crowd favourite house crispy sisig, which is an ode to the Capampangan classic but in true Manam style, is cooked crisp and sizzling to the last bite. The “twists” selection offers the same delicious Filipino taste, with an original Manam spin. The sinigang na beef short rib and watermelon is another best-seller and an original recipe of Eli Antonino, managing partner of The Moment Group. It is prepared to the point that there is a balance between the sweetness of the watermelon, the savoury taste of the beef and the sour sinigang broth. It is perfect for anyone craving for sinigang but is looking for a new exciting dish. Another signature dish is the caramelised patis wings, whose sweet-and-salty taste makes it a popular beer match. Mesa Filipino Moderne presents creatively styled modern Filipino fare that are perfect for the discerning palate, whether for small or big groups of friends and family. It is founded by father-and-son Rikki and Eric Dee. Mesa’s bestsellers that best exemplify modern Filipino cuisine are the Crispchon, suahe (prawns) on the rocks, and cripy boneless tilapia. Deep fried to perfection, the Crispchon served in two ways is heavenly crispy on the outside and soft and tender on the inside. On another hand, suahe on the rocks features fresh prawns cooked on your table, right before your eyes, in a claypot full of hot stone. The simple yet mouthwatering crispy boneless tilapia is deboned, breaded, and deep-fried and served with four kinds of sauces. The body and head of the tilapia are the main attractions of the dish, as it is twisted to form a unique shape. In addition, the pinatayong manok is a nice play on words yet another popular Filipino dish called pinaupong manok (roasted chicken in a pot with a bed of salt.) Mesa’s version—crispy whole chicken in a standing position (tayo or pinatayo is the Filipino word for “standing”) carved tableside—is far different from the iconic Filipino roasted chicken. A Filipino fiesta will never be complete without a lechon baboy or roasted suckling pig. But this classic Filipino dish has already come a long way and evolved through time, thanks to the country’s “Lechon Diva”, the chef Dedet Dela Fuente. Founder of Pepita’s Kitchen, Dela Fuente opens her home to guests for private dinners and serve a 12-course lechon degustacion highlighting the best of the Filipino fiesta staple. Don’t forget to try the 8 Treasure Lechon which is a roasted suckling pig stuffed with sticky rice, chestnuts, cashew, salted egg, and Chinese sausage. Have a serving also of Pepita’s Kitchen’s famed lechon stuffed with truffle rice and foie gras, and the unique and flavourful dish Vinta, which is a Mang Tomas sarsa ice cream in carabao milk and taro, with a crispy lechon skin. The popular Purple Yam Modern Filipino Restaurant in Brooklyn, New York is now finally home after it opened a branch in Malate, Manila. Located at its founder Amy Besa’s ancestral home built in 1949, Purple Yam gives a modern take on classic Filipino favourites. Don’t miss its Sorsogon bay crabcake with green papaya salad which has a burt of crab meat flavours. And despite its simplicity, Purple Yam’s grilled tocino marinated in achuete virgin coconut oil is a winning choice. Featuring the best of traditional Filipino and Negrense dishes done with a contemporary touch and using the best local ingredients, Sarsa Kitchen+Bar of the chef JP Anglo was borne out of the Filipinos love for sauces and condiments. Whet your palate with the roasted kalabasa (squash) and green beans. The pritchon (fried suckling pig) pancakes paired with homemade Hoisin chilli sauce are rolled up with crunchy vegetables and have an addicting quality. For a more indulgent take on the well-loved bulalo (beef shank soup), order their sizzling kansi (beef shank), complete with a chunk of bone marrow and gravy on the side. Conclude your meal with the crispy buko (coconut) pie à la mode or the empanada-inspired dessert that has the right amount of sweetness with a drizzle of pandan sauce. The cosy ambience of Sentro 1771 makes it perfect for family gatherings. The choice quality, comforting taste, and considerable portions of modernised Filipino favourites will definitely be appreciated by both the youngest and the oldest in the clan. Sentro 1771’s must-try dish is the corned beef sinigang, which brought the restaurant to fame. Diners may request the waiter for a spoonful of the soup before the dish comes out to adjust the acidity accordingly. You can order healthy Filipino dishes like the organic sisig and grilled fish of the day in a banana leaf. There are also a wide variety of adobo dishes to choose from like the chicken adobo sa gata or the catfish adobo flakes on the side. Don’t forget also to make room for the keso flan at the end of the meal. It’s actually a queso de bola cheesecake with red egg, which is sumptuous finish for a hearty meal. Located along Pasong Tamo at The Alley at Karrivin, Toyo takes the essence of Philippine flavours, traditions, and techniques, and puts it in tune with quality products. While restaurants tend to have more genres or definitions, eateries keeo things simple by focusing on serving good food to guests, making sure that they leave happy and satisfied. Some of the notable dishes the newly opened restaurant has are the three-cut pork barbeque (a modern interpretation of the Filipino streetfood), snapper grilled with homemade cultured and grass-fed butter, and the octopus, alukon (birch flower), and labong (bamboo shoots) with a broth of prawn and okra, which is making a buzz now in the local culinary scene. The chefs of this erstwhile Spanish restaurant led by the chef J. Luis Gonzalez have paid homage to their adopted land by deconstructing traditional Filipino food and giving it a wholly new character without forgetting its roots. The empanaditas and shrimp in flour are reminiscent of old Chinatown. The milkfish belly and the corn soup topped with home-grown garnishes conjure a nostalgia for old family recipes. The poached crab and yellow-fin tuna ceviche taste of a fresh morning catch in some remote beach paradise, while the suckling pig in elderberry and fried bauhinia leaf broth remind one of a Spanish era hacienda. The stripped cassava pie highlights each ingredient, with a kaffir lime infusion giving it a whole new character. Via Mare is one of the pioneer restaurants that brought about the redefined Filipino cuisine concept. It currently operates the Café Via Mare, a truly Filipino café that boasts heartwarming fares such as bibingka, puto bumbong, pancit luglog, and dinuguan to a different level. Heading Via Mare’s management team is the visionary, Glenda Rosales-Baretto. The restaurant’s tinola flan (rich chicken soup with ginger, lemongrass steamed with egg and milk into a light custard) is a refined way of serving the classic Filipino soup—instead of serving it in a soup per se, the flavours are absorbed into a light custard. The crispy adobo flakes (shredded pork adobo, toasted to a chewy and crisp finish) is more versatile as it can be used as an appetiser or sandwich filling. Lastly, the Balut Surprise (succulent duck embryo with garlic and white onion sauce, topped with pastry) is a world-class dish inspired by the classic street food. Fely J is an amazing heritage restaurant with heirloom recipes from the mother of restauranteur, Larry J. Cruz, and to whom the restaurant was was dedicated to. From the ambience to the dishes, there is a home-sweet-home feeling that takes you back to one's favourite dishes growing up. The restaurant's must-try dishes include their famous Fely J's Temple Crab paired with Aligue garlic rice, that just takes you on a journey of crustacean flavours; the Lamb kaldereta that shares the perfect blend of spices to the palate; and the crispy Tilapia with sweet plum sauce that elevated the traditional deep-fried fish dish to a new level of extraordinary taste.